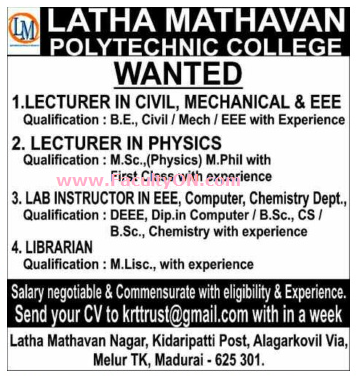 Latha Mathavan Polytechnic College, Madurai has advertised in the DINAMALAR newspaper for recruitment of Lecturers Plus Non-Faculty jobs vacancies. Interested and eligible job aspirants are requested to apply within 07 days from 20th May 2018. Check out further more details below. About College: The Latha Mathavan Polytechnic College is affiliated to Directorate of Technical Education Board, Govt. of Tamil Nadu, Approval No.G.O.M.S.No.434 dated 15.7.1996 and also approved by All India Council for Technical Education, Govt of India, New Delhi, Approval No.F.73052-149(E)/ET/96 dated 23.5.1996.